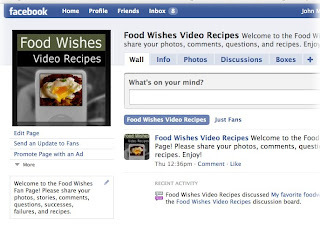 Food Wishes Video Recipes: Finally, a Food Wishes Fan Page on Facebook! Finally, a Food Wishes Fan Page on Facebook! Thanks to the social networking revolution, we now have the platform for a Food Wishes fan page on Facebook. While it's very hard to do here on the blog itself, this Facebook page with allow you foodwishers to post photos of your recipes. Hopefully, you will also share your brilliant ideas, tell stories, have spirited discussions, ask each other questions, and so forth. If you are interested in being one of the moderators, please email me and I will hook you up. I'm sure I could use a little help keeping the page Food Wish focused. So, it you are a regular on this site, and you make the dishes seen here, please go and become a fan, and begin sharing your food with others! I'm not any kind of Facebook expert, and don't spend a ton of time there, so please feel free to make suggestions on the site's wall. Enjoy! And there was me thinking 'surely Chef John is on facebook' and couldn't find you anywhere lol that explains it! Key here Chef John fans - social networking, it's all a the guy has available who works for you, For Free! He has no PR firm working for him, or budget for advertising, so support his efforts to promote himself, or don't, but spare the rest of us and don't quibble here about it. Will log in once I get home from work. Cant access facebook at the office. They know me all to well. Is Authentic Beef Teriyaki Really Better?